Sheetal Sekhri is an Assistant Professor in the Department of Economics at University of Virginia, an affiliate of the International Growth Centre (IGC), India Country team, and a Giorgio Ruffalo Research Fellow at the Harvard Kennedy School (2012-2013). 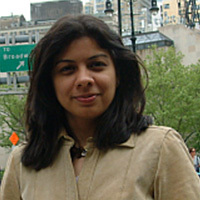 Sekhri received her Ph.D. from Brown University in 2008. Her research focuses on the delivery of public services and safety nets, higher education and skill development and water related issues in India. Her past research has examined the role of informal networks in improving take-up in the public distribution system in India and understanding the returns to public college attendance in Indian labor markets. Current projects involve evaluating the implications of regulatory capture for groundwater depletion in India and implications of improvement in public distribution system for women’s health. Her work has been published in academic journals such as the American Economic Journal: Applied Economics. Tertiary education has fuelled the economic growth in India in recent times. This has in turn generated excess demand for a highly educated and skilled workforce.